Every year, London’s contemporary art scene behemoth – the Whitechapel Gallery – commissions artists to engage with a topic relating to children. This year, Brazilian artist Rivane Neuenschwander has interpreted that brief to create a physically moving collection entitled ‘The Name of Fear‘. Exploring childhood fears, its title comes from the 1972 song ‘Araçá Azul’ (1972) by Brazilian composer, singer and writer Caetano Veloso, and echoes the poem ‘O Medo’ (Fear) by Brazilian poet Carlos Drummond de Andrade. 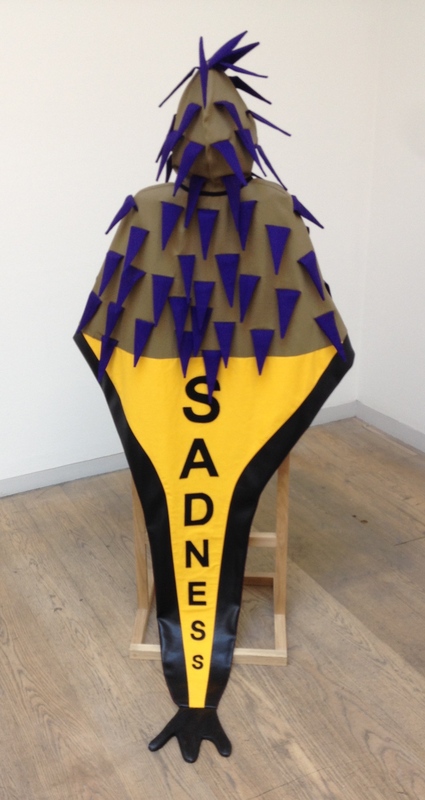 Neuenschwander attempts to write psychological health, trepidation and hope through an installation of child-sized capes, sometimes two-armed, sometimes two-headed, but all a form of accoutrement that envelops the body. 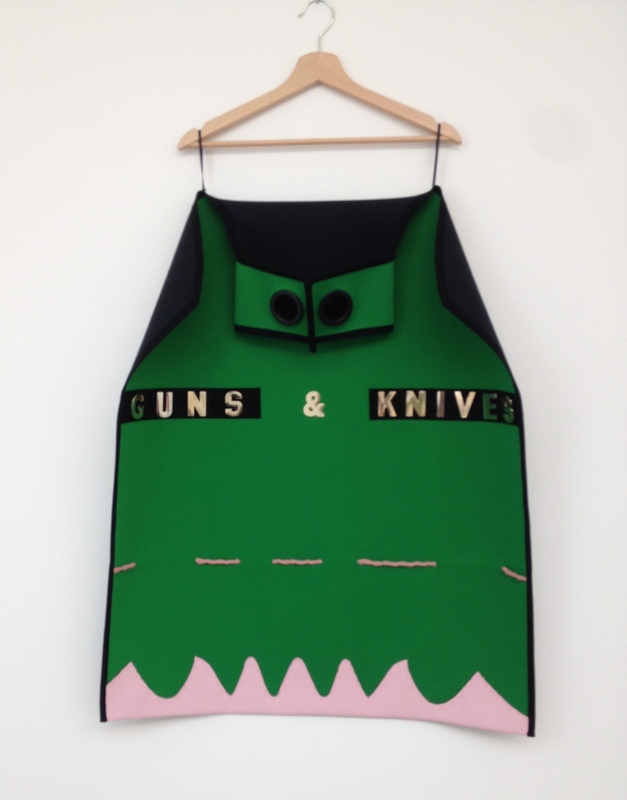 ‘Guns and Knives’. Image Credit: A Bow-Bertrand. ‘The Name of Fear’ is a successor to her collection of over a decade ago ‘I Wish Your Wish‘ (2003), once again inspired by the cultural heritage of her homeland and the pilgrim tradition of bandaging their wrists with fabric on which their wishes and hopes are inscribed. The wish proposition and fulfilment chain is, surprisingly perhaps, frequently linked with deep-rooted personal fear. ‘Ebola’. Image Credit: A Bow-Bertrand. ‘Fear’ in the context of global health needs some definition. The Oxford English Dictionary describes it as: ‘the emotion of pain or uneasiness caused by the sense of impending danger, or by the prospect of some possible evil’. Certainly, the subject of fear has a history of negative associations, being linked to derogatory labels such as ‘wet’, ‘coward’, ‘wimp’ as well as diagnostically identified as triggering stress and inspiring the millennium era acronym FOMO (fear of missing out). However, ‘fear’ is an abstraction, and cannot be delineated by any such qualitative frames. After all, what is the film industry’s horror genre for, if not to entertain through inducing fear? So too, fear is something to be considered from both anthropological and psychological stand-points. Way back in the seventeenth-centry, when Robert Burton published ‘The Anatomy of Melancholy‘ (1621), he identified his subject as transitory, caused by a composite of mental perturbations, fear, discontent and vexation of spirit, worthy of consideration and alleviation. ‘Sadness’. Image Credit: A Bow-Bertrand. This latter point appears crude but is pivotal to considerations of the role that fear plays in global health. In the international age of Big Data and health policy analysis, ‘fear’ is often used interchangeably with ‘risk’, with little thought given to the differences between the two. ‘Risk’ bears a possibility of loss, reversal of fortune and active engagement with a situation, while fear remains a complex state canvassing both measurable and qualitative indices. It is my thinking that fear is the precursor to all the risks taken in the field of humanitarian aid. 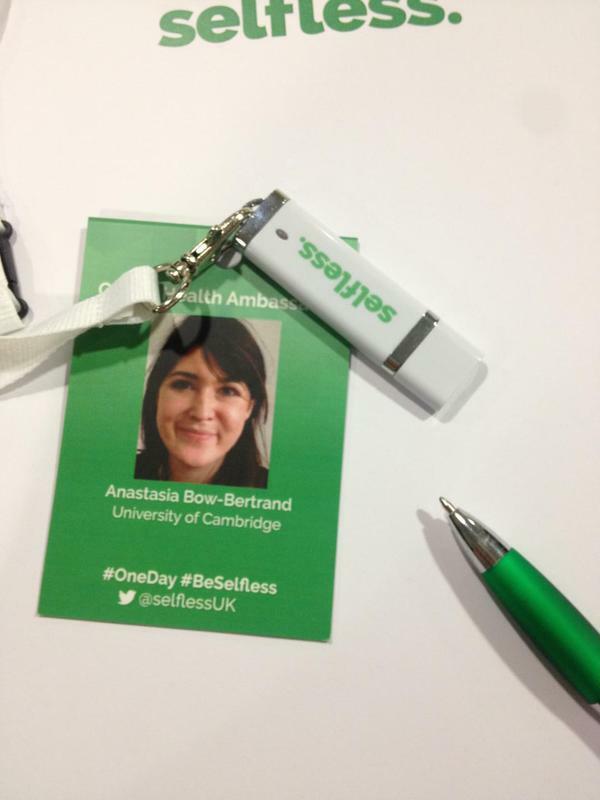 This past weekend I attended a development conference as an elected Global Health Ambassador for an organisation called Selfless. In his opening speech, founder Dr Na’eem Ahmed shared his vision and motivations. He referenced the desire to make a difference to communities that could best profit from cost and user effective health interventions. The organisation’s central belief is that human endeavour is the most potent tool to encourage social change. What is it that instigates that endeavour? Fear. Ahmed, like fellow speaker Seth Cochran of the fast-growing start-up Operation Fistula which seeks to achieve comparably nominal levels of fistula occurrence across critical areas Africa and Asia as benchmark continents of Pan-America and Europe, are engaging in risky business. Selfless and Operation Fistula are founded by individuals who are acutely aware of their own humanity, and afraid of the possibility that under different circumstances they could well be in need of the aid which they help to provide. The modern ‘we’ all fear the unknown; the ‘other’; hypothetical scenarios. Many media outlets do a remarkably good job of scaremongering the general public with headlines such as ‘the UK has all conditions required for malaria mosquito to thrive’, and ‘the migrant crisis: you could be next’. True, but unreliable. When used appropriately, the intangible, universal state of being afraid and of experiencing fear can be channelled into global health policy that addresses a crisis or conflict dilemma, while controlling and capping that emotive experience. It would be plausible to speculate that Cochran, a private equity professional turned humanitarian, and Ahmed, champion of the self-coined term ‘skillanthropy’ fear becoming the complacent, profitable, upper income national they could easily be perceived as. Regardless, altruism and fear can generate potentially world-shaping wins for the humanitarian sector when risks are taken, managed and outcomes used as learning points. ‘Strangers’; Nightmares’. Image Credit: A Bow-Bertrand. 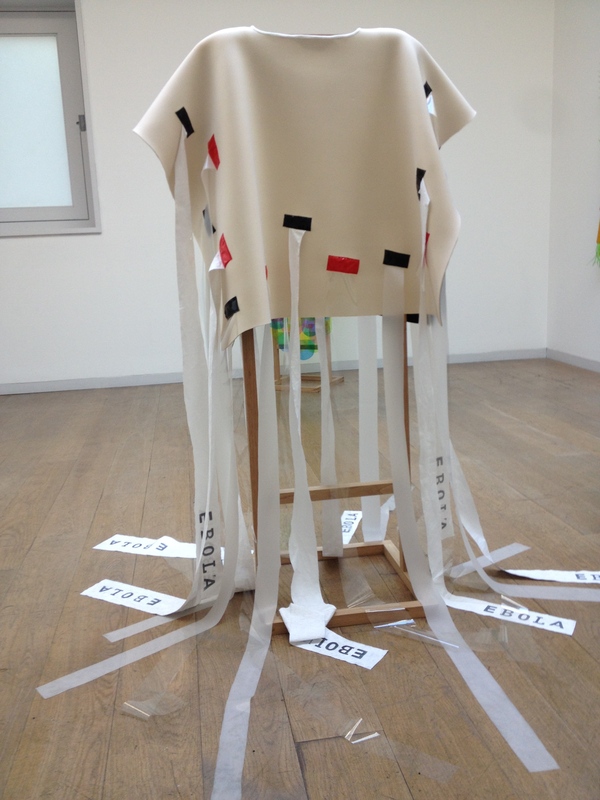 The crawling ribbons of Neuenschwander’s ‘Ebola’ cape were inspired by a child’s fear. Hanging limp on its display stand, there is little that could conjure that same transitory state of being. And that is precisely the point. By choosing to put on cloaks of fear – of natural disaster, of epidemics, of failed vaccine supply chains, of famine – of fears that impact the world’s health and its’ citizens’ ability to survive, we are choosing to inhabit a space in which change is possible. ‘Thunder’. Image Credit: A Bow-Bertrand. The capes enact what psychoanalytical studies, most notably those of the formative Sigmund Freud, might call ‘projection’ ( the process whereby aspects of ourselves – usually negative ones – are not recognised as part of our being but are attributed to another. It is a way of disowning our own desires, fears or antagonisms). By holding up our fears for inspection through art, writing and experience, high-impact policy can be considered, and collective fear can be turned to positive, multi-disciplinary health change for a brighter future.